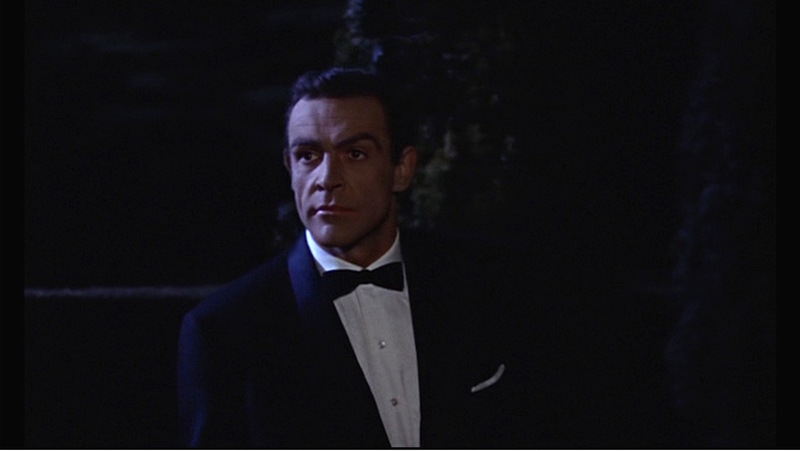 This sequence provides some interesting cultural context; formalwear was nowhere nearly as prominent in Ian Fleming’s literary Bond adventures as it would become in the films, yet the opening scene of the second film seems to recognize and lampshade the fact that the audience will know this is James Bond because we’re seeing Sean Connery in a dinner suit. The opening scene is a cheap gag and not the last time the series would try to “trick” the audience into thinking Bond is dead. Of course, a dead Bond means a dead franchise and even the least cynical of movie-goers know that EON Productions would never shoot itself in the foot like that. Wisely, editor Peter R. Hunt – later to direct On Her Majesty’s Secret Service – moved the scene from the middle of the film to a quick teaser before the credits, introducing the now-traditional pre-credits sequence that Bond fans have come to expect. 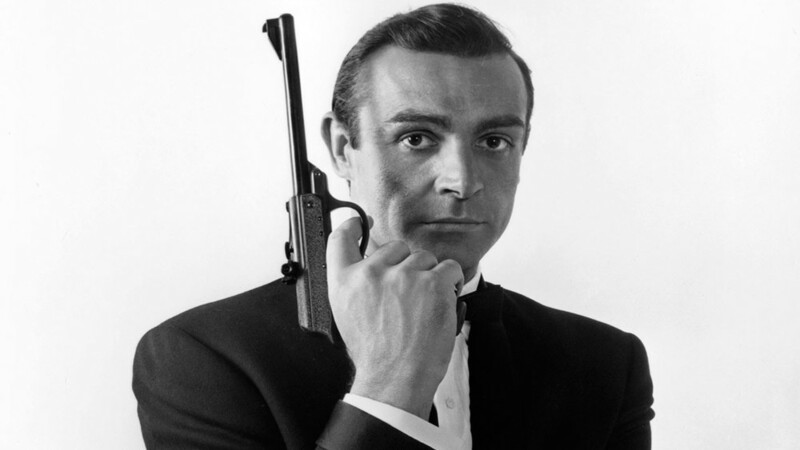 007 himself would not appear until nearly 20 minutes into the story. The impostor’s sharp midnight blue tuxedo has all of the characteristics of classic Bond dinner suits, blending Anthony Sinclair’s timeless tailoring with fit and style details contemporary for 1963. It shares many similarities to the tuxedo that Connery wore previously in Dr. No for his iconic “Bond, James Bond” introduction, but the slimmer, more streamlined look informs us that this is not an identical suit. The single-breasted dinner jacket has very straight, narrow shawl lapels. The hip pockets are jetted, and a white linen handkerchief is nearly folded in the welted breast pocket to provide a subtle and welcome contrast against the darkness of the scene. Sneaking around SPECTRE Island at night isn’t smart. The classic “turnback” jacket cuffs make a return from the Dr. No tuxedo, paired with four covered buttons on the end of each sleeve. This would be the last appearance of turnback gauntlet cuffs on a Bond dinner jacket until the classic Tom Ford dinner jacket worn by Daniel Craig in Quantum of Solace. Due to the darkness of this brief sequence, other details are difficult to ascertain, but the jacket likely has no vents. The shoulders are straight with roped sleeveheads. The lapels, the single front button, and the gauntlet cuffs are all faced in midnight satin, rather than pure black. 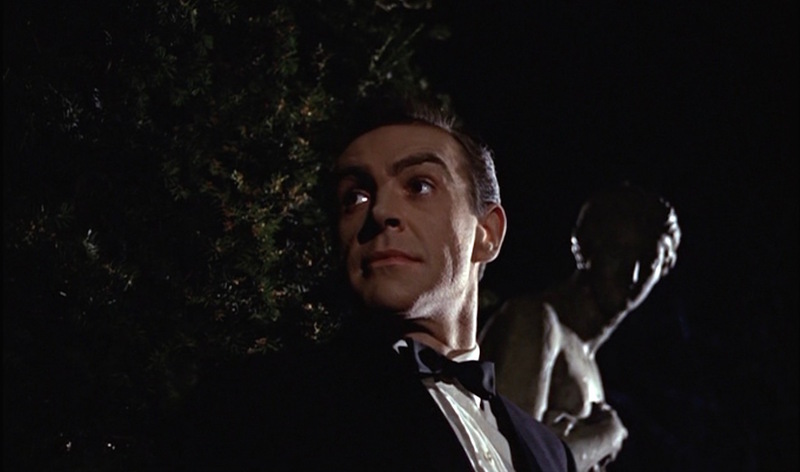 When 007 first emerges from the hedge maze, his white shirt provides a stark contrast against both the dark night and his midnight tuxedo. The shirt has a traditional English spread collar and stitched front placket with mother-of-pearl buttons, which Bond prefers to studs on his formal shirts. The French cuffs are fastened with links that appear to be the gold discs he wears in most of the early films, although the promotional photos show a more ornate design. After Red Grant works his garotte and “Bond” falls dead to the ground, Grant pulls off the mask to reveal the mustached impostor. This also reveals more of the shirt, including the 1/8″-pleated front. Bond’s bow tie is a very slim “batwing”-shaped tie with straight blades on each end. The narrow batwing is the most flattering tie shape for this slim dinner suit. It appears to be midnight satin to match the lapel facings, although it might also just be black. 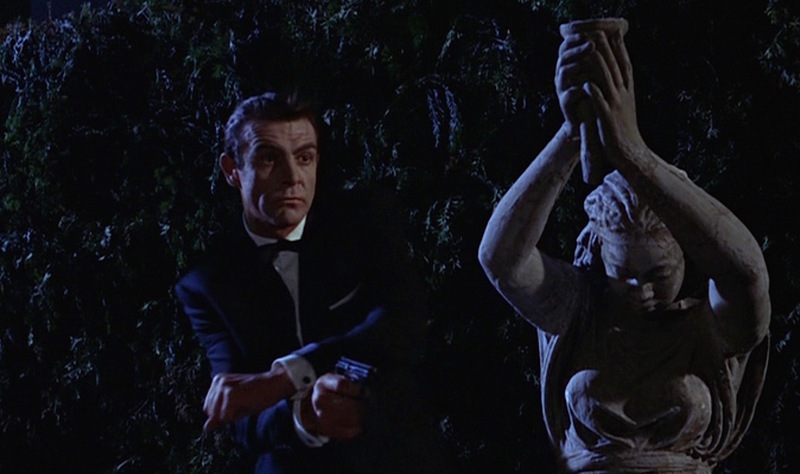 The statue behind Bond looks eerily similar to the one that Oddjob would make short work of a year later. The lower half of Bond’s outfit in the scene is almost totally guesswork, but the trousers definitely have a traditional rise with double forward pleats and midnight silk side striping. 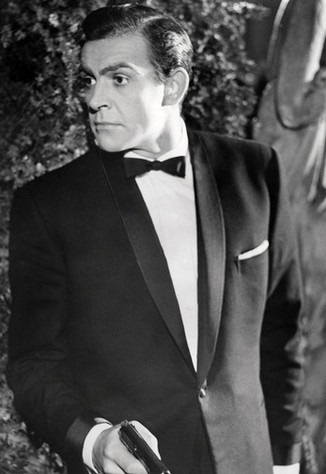 Bond always followed black tie rules with plain-hemmed bottoms on his formal trousers, and promotional photos indicate that these tapered leg trousers are no exception. 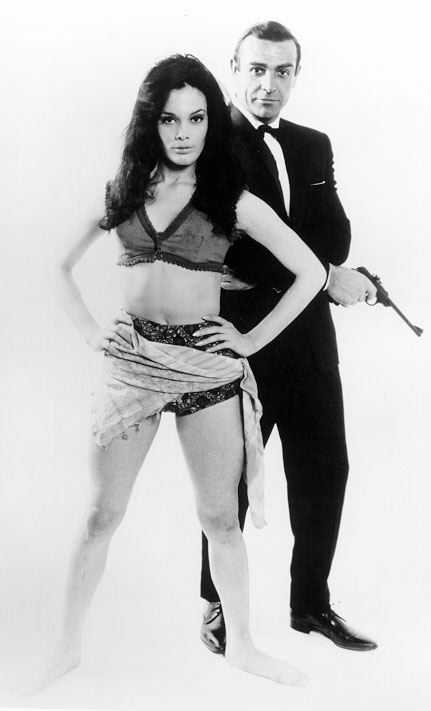 Connery poses with Martine Beswick, who played Zora in this flick and later the much tanner Paula in Thunderball. Based on the promotional photos – again – it looks like Bond is wearing his usual black patent leather plain-toe oxfords. Oxfords – or balmorals – are the preferred practical shoe* for black tie, although later Bonds also wore less formal bluchers/derbies and even slip-on loafers. * I consider opera pumps – the most formal men’s footwear – to be impractical. A very accurate Bond costume would also include a light brown chamois leather shoulder holster with a blue nylon strap, and – if you can swing it – a stainless Rolex Submariner with a black dial secured to your left wrist via NATO strap. NATO straps appear to be making a comeback, thanks in part to their reappearance in Spectre after a 50-year absence from the Bond franchise. If you’d like an awesome graphic breakdown of all of Bond’s dinner suits over the years, check out Matt Spaiser’s infographic from January. 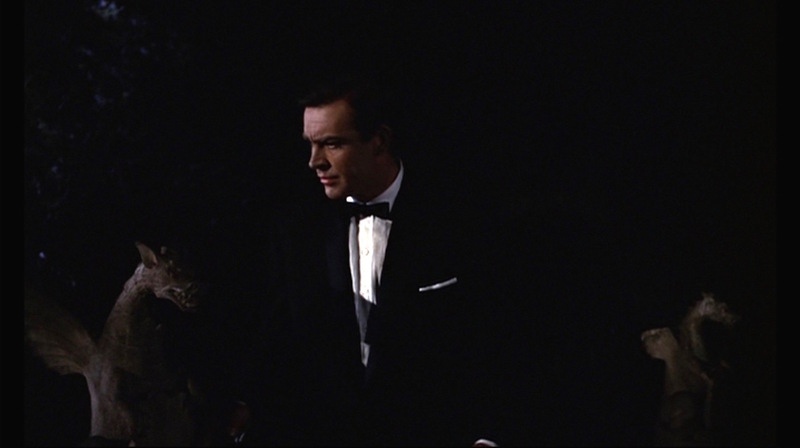 Matt also covered this tuxedo in a post on his blog, The Suits of James Bond. Even though this isn’t technically James Bond (in the film’s narrative), it’s a classic 007 look and the promotional material featuring Connery in his From Russia With Love dinner suit holding a long-barreled Walther air pistol has become iconic in its own right. From Russia With Love – in fact, this scene – is the first time we actually see James Bond carrying an actual Walther PPK, as it is now well-known that the “PPK” in Dr. No was actually the slightly larger Walther PP. Bond’s PPK is chambered for the somewhat anemic 7.65 mm (.32 ACP) round, although carrying the .32 rather than the larger .380 gives him one extra round in the magazine. 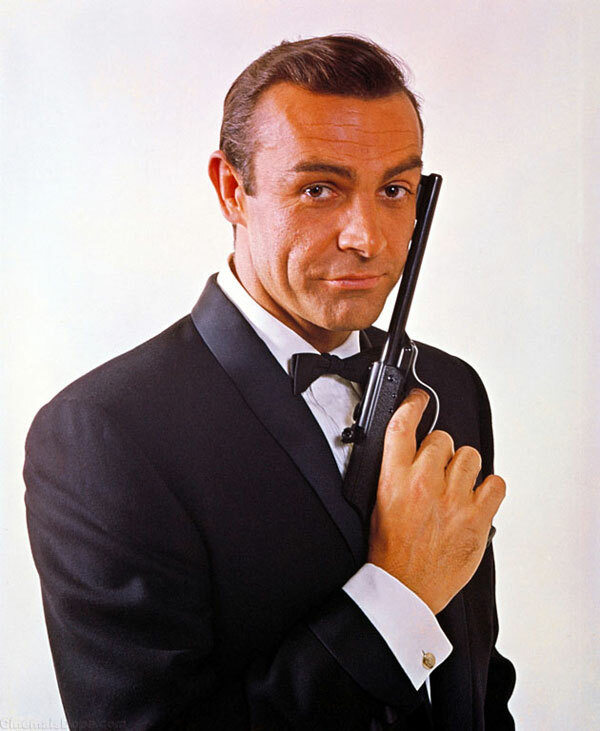 The famous image of a tuxedoed Sean Connery smirking while holding a Walther pistol near his face – seen a few times in this post alone – was taken during a promotional shoot for From Russia With Love. However, the pistol is not an actual firearm; it’s a Walther LP-53 air pistol. When photographer David Hurn was taking photos of the actors, the film’s propmaster either misplaced or simply forgot to bring Bond’s signature PPK. The quick-thinking Hurn improvised by getting his own Walther air pistol and using it for the shoot. 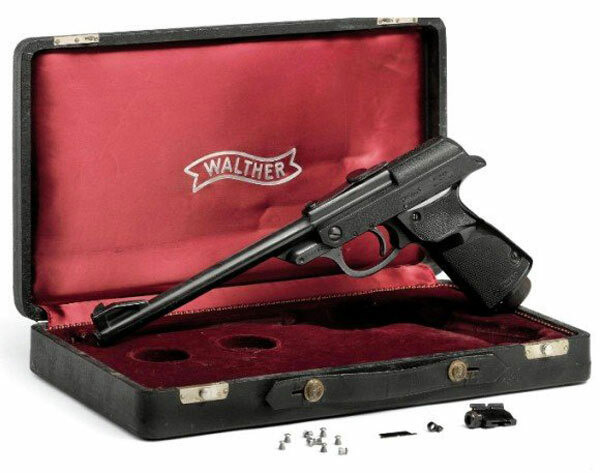 Nearly 50 years later, Hurn’s original Walther LP-53 from the shoot was auctioned by Sotheby’s for $439,000. David Hurn’s Walther LP-53 saved Sean Connery the embarrassment of being featured on movie posters doing finger guns. Knowing that it’s an air gun still doesn’t excuse some of the egregious firearm safety violations. Buy the movie and have a Happy Halloween! Sean always did look sharp in a tux, impostor or not. And while I’m here, I DO have a bone to pick with the fact that Omega have ‘re-issued’ a black and grey NATO strap, considering the fact that Bond’s original NATO (while not actually a NATO strap, but rather a simple pass-through nylon one, but that’s another story) was black and green, with possibly a thin red stripe thrown in. These colours only became noticeable once the film switched from poor-quality VHS to DVD and BluRay, where the true colours of the strap were able to be seen. Some folks, however, have stated that the red might actually be digital artifact produced by the green hue of the strap. Complicated, ain’t it? Still, it’s the subject of many arguments on wristwatch forums. Why is the NATO strap mentioned here? Connery only wears the striped (not NATO) strap in Goldfinger and Thunderball. He originally wore the Submariner on a leather strap. 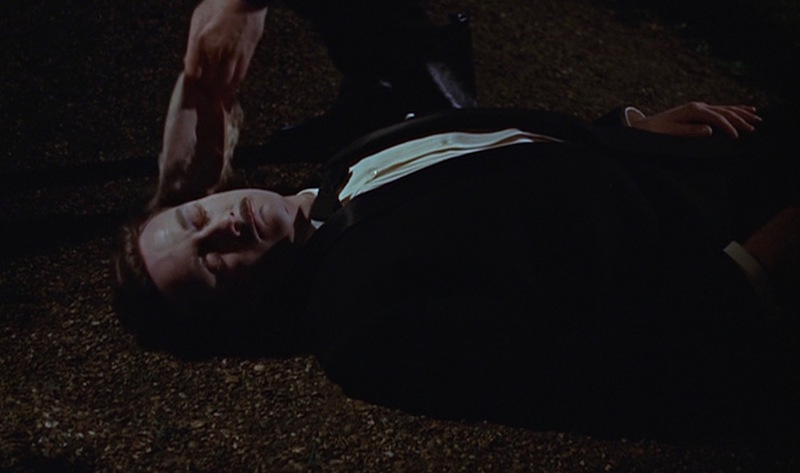 And Connery’s Bond wouldn’t be wearing a diving watch with black tie unless he was diving in black tie. Teeritz – With my sadly low income status, I’ve been reduced to learning about the NATO vs. striped straps only through online forums 😦 AND I was on vacation during your 007 nylon strap post this summer (http://teeritz.blogspot.com/2015/07/the-bond-nato-strap-as-i-understand-it.html, which I’m now sending to a few interested friends!) so it became a rare Teeritz post that I missed. Time to dive (heyoo!) back into my terminology bank and straighten out a few things.